Stuck in a TIE Fighter all day? Pack your Star War Galactic Empire Travel Bag with some necessities to freshen up along the way. This subtle bag features multiple storage compartments and a hook so you can hang it up for convenient access! Measures 9-inches x 8 1/2-inches x 3 1/2-inches. 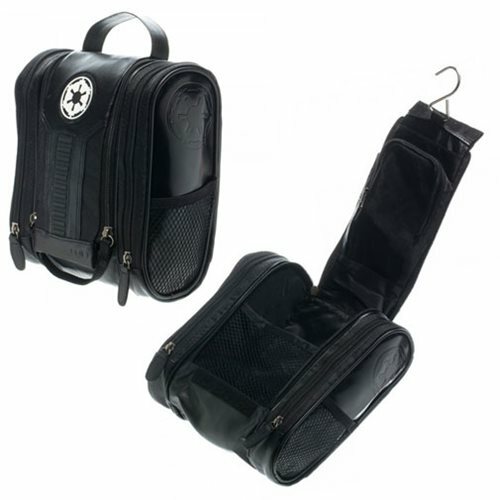 The Star War Galactic Empire Travel Bag includes: 2 side zippered vertical compartments, 1 main zippered compartment containing 2 inner mesh dividers and 1 zippered mesh compartment, and two outer mesh pockets. Velcro closure for easy access to main compartment.